Yambio - More than 300 child soldiers were released on Wednesday by armed groups in South Sudan, the second-largest such release since civil war began five years ago. More than 19 000 children are thought to have been recruited by all sides since the civil war broke out in 2013. The UN has released almost 2 000. More than 10% of them have been under age 13. Human rights groups say child recruitment continues, even as South Sudan's government says it has committed to ending the practice. 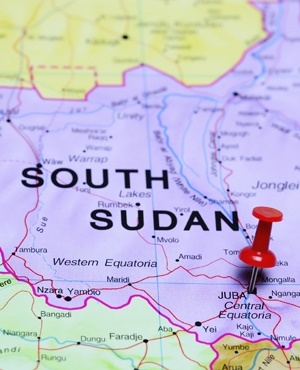 "The continued recruitment and use of children by the military and opposing armed groups points to the utter impunity that reigns in South Sudan, and the terrible cost of this war on children," Mausi Segun, Africa director at Human Rights Watch, said in a new report this week. One 17-year-old who had been abducted and forced to fight attended Wednesday's ceremony while clasping his arms around his stomach and staring at the ground. He gave only his first name, Christopher. "They told me to kill my mother," he said, his voice barely audible. After being seized from his home by opposition soldiers at the age of 10 during a period of localised fighting, he said his mother came into the bush to plead with his commanders to set him free. "When she came they told me to shoot her or I'd be killed instead," the boy said. "I had no option, I just asked God to forgive me." But he had never shot a gun, and when he pulled the trigger it jammed. His mother escaped. The released children will be reunified with their families and given three months' worth of food assistance and psychosocial support, along with the opportunity to go to school. Although aid workers were optimistic, they worried that renewed violence could force the children back into armed groups. A new round of peace talks began this week in neighbouring Ethiopia, mediated by a regional bloc. "If peace isn't sustained and people are forced to the bush, we'll lose these children," said Anne Hadjixros, a child protection officer with Unicef. Speaking at Wednesday's ceremony, South Sudan's First Vice President Taban Deng Gai called the release of child soldiers a sign of peace. He also warned other countries, particularly the United States, against criticism from those in "glass houses." Some in the East African nation have responded angrily after the US imposed an arms embargo last week. The vice president said the US had had to learn from its mistakes and South Sudan would, too.